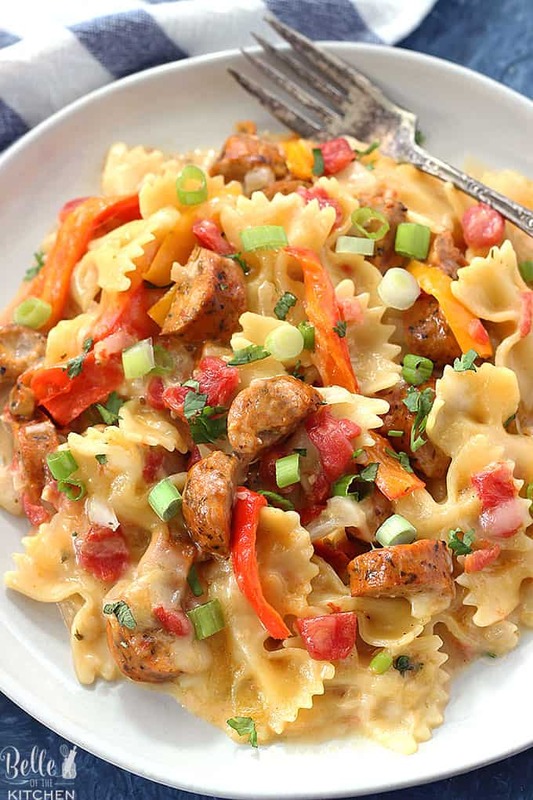 This Cheesy Sausage and Peppers Pasta is made in one pot and is one of our dinner time favorites. 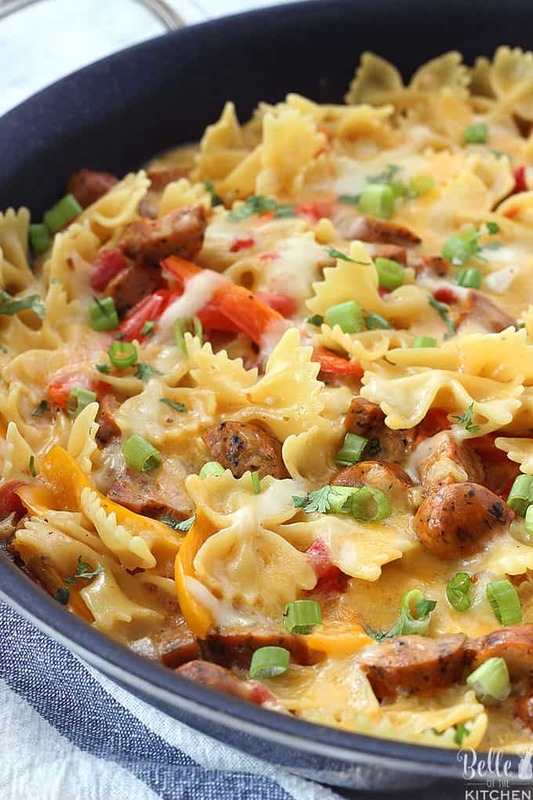 It’s full of juicy sausage, veggies, and pasta, all drenched in a creamy sauce and topped with melty cheese! Hey y’all and happy August! Can you believe it’s back-to-school time again? This summer has felt like a combination of “zipping by so fast” intermixed with days of “moving at a snail’s pace” for me. And because of that, my hat goes off to all of the amazing teachers out there who are headed back to the classroom to wrangle those said rowdy kiddos. 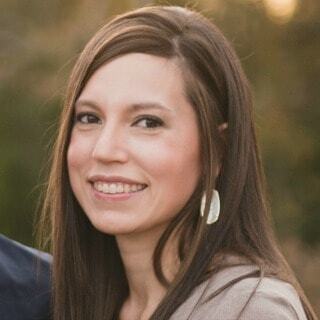 Y’all are amazing, and I’ve been in your shoes! I hope your school year is a great one and you know how much you’re appreciated! I am looking forward to school starting back, as I like routine and we haven’t had a whole lot of that this summer. Which isn’t exactly a bad thing because we’ve had a lot of fun little adventures and have made some good memories together. And though I will miss the kids (for the most part????) it will be nice to have a regular schedule again, and more time to work and cook up recipes for y’all! 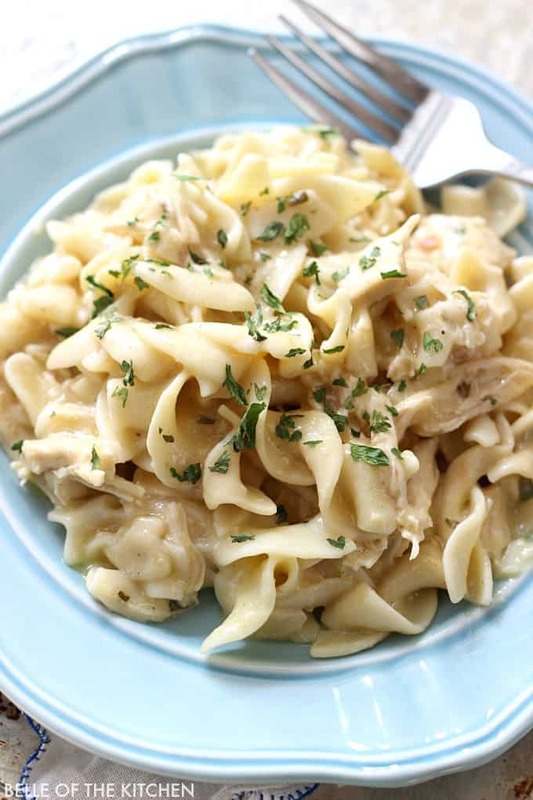 And because of the busy-ness that comes with the back-to-school season, easy dinner recipes are a necessity! I’m a huge fan of one pot recipes because I hate dishes, and this cheesy sausage and peppers pasta is perfect for minimizing your time spent cleaning up afterwards. 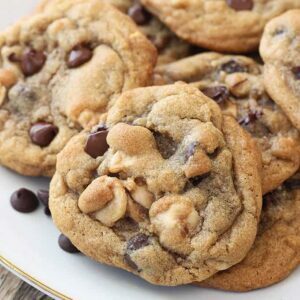 My kids LOVE this recipe, and that’s saying a lot! They love sausage, and peppers are one of their favorite veggies, so they scarf this down. The cheesy sauce makes this creamy and delicious, and I bet it will be a favorite with your family, too! 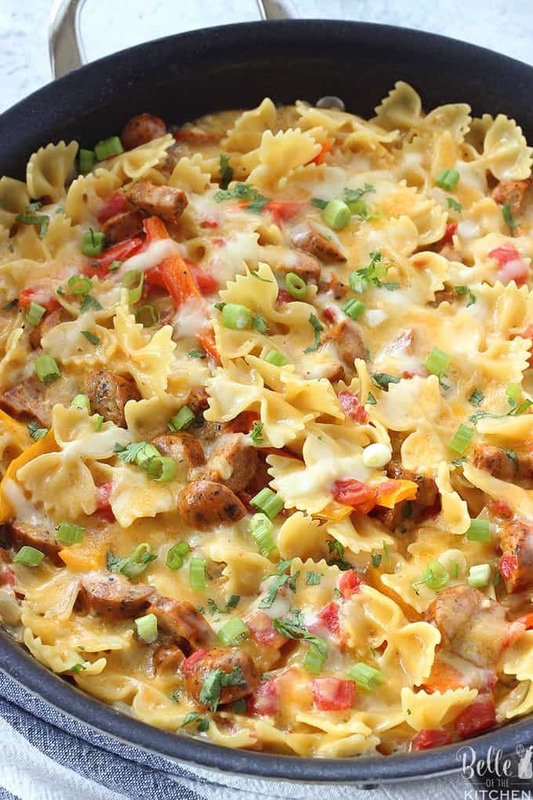 This Cheesy Sausage and Peppers Pasta is made in one pot and is one of our dinner time favorites. 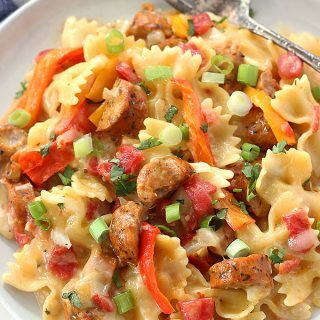 It's full of juicy sausage, veggies, and pasta, all drenched in a creamy sauce and topped with melty cheese! Heat the olive oil in a large nonstick skillet over medium high heat, then add the sausage to the pan. Cook until sausage is browned, then add the chopped onions, sliced peppers, and garlic. Cook for 5 more minutes until vegetables are softened and garlic is fragrant. Add the chicken broth, heavy cream, Rotel, and dry pasta to the pan. Season with salt and pepper to taste and stir everything well. Turn the heat to low and cover the pan with a lid. Cook undisturbed for 15 minutes or until pasta is cooked through. Stir in 3/4 cup of the cheese. Top with the remaining cheese, then place the lid back on the pan and cook for another 3-4 minutes until cheese is melted. Garnish with green onions and cilantro. Enjoy! Uncooked. It will cook with all of the other ingredients. Do you have to use heavy cream? How do I love thee pasta — let me count the ways. If it has cheese and sausage in it I’m totally enthralled! The recipe sounds like the perfect weeknight dish. Easy and super tasty!! Great recipe. You had me at peppers! 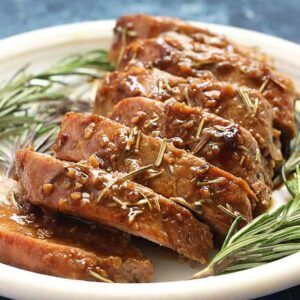 I’m always looking for new tasty ways to incorporate them, since they’re my favorite and this recipe was perfect! Simple, yet flavorful. I’ll be making this again really soon, thanks! 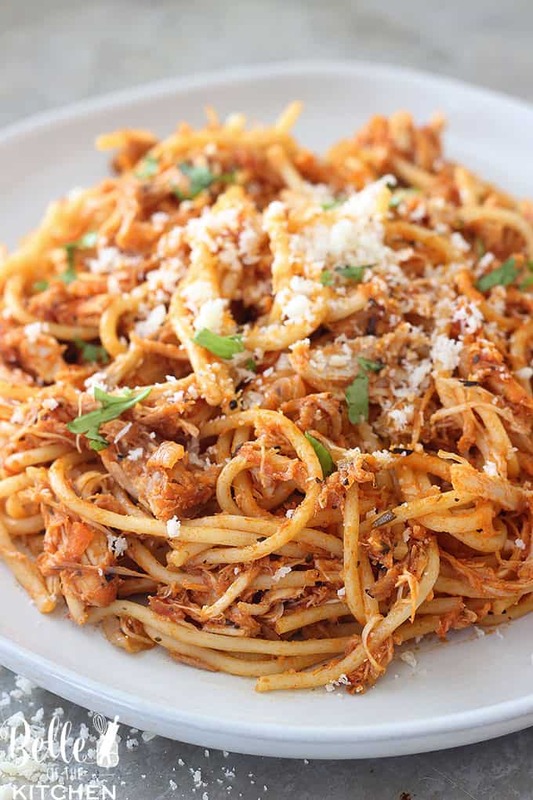 Pasta is always a simple go to meal at my house, and when it’s in one pot, all the better! Looks yummy. Such a beautiful one pot meal! Those flavors sound absolutely incredible. I can’t wait to make this at home. Made this last night for my boyfriend and I and we loved it! We used the original rotel for a little kick. We will definitely be making this again! Thanks for a great recipe! Yay! Glad y’all enjoyed it, Robin! Nothing says Friday night meal to me like pasta n sausage!! 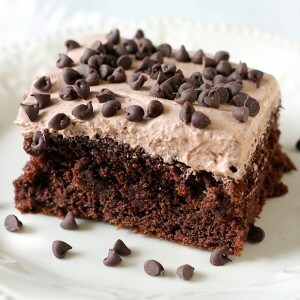 This looks so delicious n quick. I hear ya with the kids, we are definitely count down the days here. I think I will make this this week over here. We got a busy couple of days and this will be perfect. WOW! What an amazing recipe, I love these flavors and in ONE PAN!! Less dishes for me is always a plus! 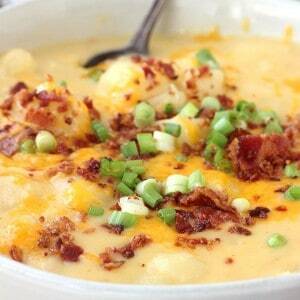 You really can’t go wrong with one pot meals! Looks tasty! One pot recipes are my favorites. This one looks SO GOOD. Love the sausage addition!